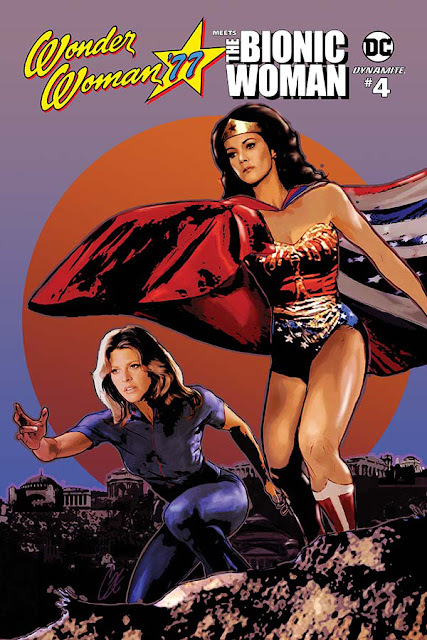 By this point, you have to love Wonder Woman and Bionic Woman as we enter issue four. Andy Mangels and Judit Tondora have brought not only a nostalgic crossover of television icons together but a great duo of heroic and kind-hearted women with great respect for each other and justice. The heart and joy of 'Wonder Woman '77 Meets the Bionic Woman' #4 is seeing Jamie Sommers being welcomed to Paradise Island as Wonder Woman brings her home for a visit. It's a scene fans may not have ever imagined before this comic arrived but get to relish the love and hospitality of the Amazons. The beauty of crossovers like this is making things that seemed impossible possible. Two characters from different worlds brought together to fight a malicious menace that combines the idiosyncracies of each into one fantastic fun read. Along with Diana's mother, Queen Hippolyta, we get to see a couple of fan favorites from the television series. Drusilla, played by Debra Winger on the ABC series as Wonder Girl, appears as Diana's younger sister and joins Jamie, her dog Maxmillion, and Diana on the invisible jet near the end of the issue. Carolyn Hamilton, played by Jayne Kennedy on TV, also makes a cameo. Diana explains to Jamie that women have been brought to Paradise Island to escape oppression or to rebuild their lives. The island is not just home to the powerful amazons but also a haven to empower women from all over the world. Meanwhile, Dr. Wells is still being held hostage by a team of villains including Dr. Solano, Dr. Franklin, Dr. Cyber, Orlach Hoffman, and Captain Radl. Their nefarious plan is taking shape in planning one big attack. Can Wonder Woman, the Bionic Woman, and Wonder Girl stop them before they unleash their master plan?! Judit Tondora and Roland Pilcz lay out a fun and colorful adventure that really shines while on Paradise Island. It's unavoidable to portray Diana's island as anything but a picturesque locale with lush landscapes and a bright sunny atmosphere. Tondora's designs are clean yet effervescent and Pilcz's colors hit the right bold and bright tones. 'Wonder Woman '77 Meets the Bionic Woman' continues to be a fan's dream. Issue four introduces us to some old friends while setting up the villains' evil plan with a climatic ending. If you love these amazing women from an era gone by then this is your sweet spot. Mangels and company give you what you want with a beautifully conceived adventure totally in keeping with the series it's based on.